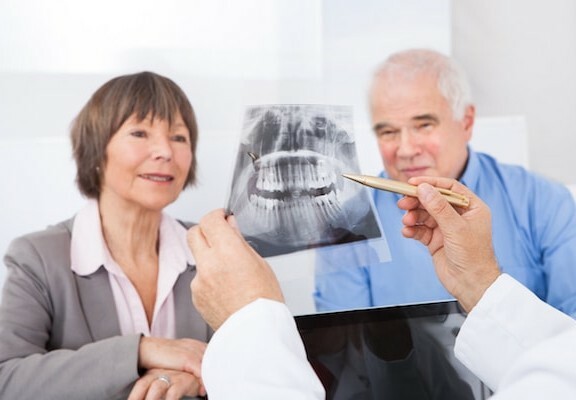 Periodontal disease – This refers to the condition that affects the supporting structures of the teeth and is the most common oral health problem of older people. Periodontal disease comes in two main forms, gingivitis and periodontitis, and they are both caused by plaque. Gingivitis is the inflammation of the gum tissue that causes the gums to be red, spongy, swollen and bleeding. If gingivitis is left untreated, it often leads to periodontitis which is a more advanced form of periodontal disease. In periodontitis, there is also destruction of the ligaments and bone that supports the teeth. As a result, the gums pull away from the teeth and recede. Most patients will not realize that they have periodontal disease because both gingivitis and periodontitis are painless. When they decide to seek treatment, the disease is often at its advanced stage and can ultimately lead to tooth loss. Periodontal disease is very preventable and treatable. Since plaque is the main cause, good oral hygiene is already enough to prevent the disease from developing or to stop its progression if it’s already there. Regular dental visits for professional cleaning can actually reverse gingivitis and bring the gum tissue back to good health. Periodontitis is not reversible but treatment can stop its progression. Sensitivity – This is another common oral health problem among older people and it is often related to periodontal disease. As the gums detach from the tooth surface and recede, the roots of the teeth are exposed. Unlike the tooth crown, which is covered by enamel, the tooth root is protected by a much less stronger substance called the cementum. The cementum is permeable to fluids so sensitivity is felt whenever the patient has hot, cold, sweet or sour foods and beverages. In fact, even exposure to cold air can trigger sensitivity. To minimize sensitivity, the patient is advised to use toothpaste specifically made for sensitive teeth. He or she may also opt for professionally-applied fluoride gels or varnishes to get an immediate effect. 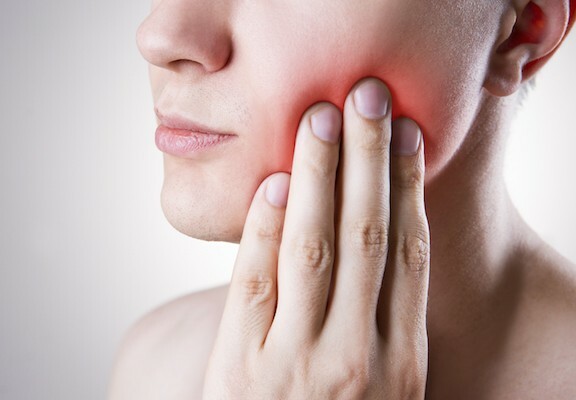 If the problem persists, a consultation with a dentist is required immediately because sensitivity may also be a sign of tooth decay or fracture. Root Surface Caries – Another oral health problem that can arise as a result of periodontal disease is the development of root surface caries. The cementum that makes up the tooth root is much more prone to acid attacks compared to enamel. Older people tend to experience dry mouth as a side effect of the different medications they are taking. Saliva acts as a buffer to the acid generated by the bacteria in the mouth. Without saliva, there’s nothing to stop the acids from destroying the tooth. Dry mouth is among the many factors that bring older people to another round of cavity-prone years. To prevent root surface caries, the patient is advised to use fluoride toothpastes. Professionally-applied fluoride gel and varnish are also effective. Dry Mouth – A condition also known as xerostomia, dry mouth is characterized by decreased salivary flow. It is usually caused by medications, radiation treatment to the head and neck and also certain conditions like Sjogren’s syndrome. Medications that can cause dry mouth include those taken for allergies, asthma, anxiety, depression, hypertension and high blood cholesterol. Even common pain medications may lead to dry mouth so it is extremely important for a patient to tell the dentist all the medications he or she is taking. To prevent dry mouth from getting worse, the patient has to avoid any food and beverage that may irritate the mouth. These include alcoholic drinks, coffee, soda and fruit drinks that are too acidic. In order to stimulate the production of saliva, the patient is advised to chew sugar-free gum. Denture Stomatitis – This refers to the inflammation of the soft tissue beneath the denture. Common causes include poor oral hygiene and ill-fitting dentures. It can also occur in patients who don’t clean and remove their dentures at night which can cause yeast to buildup. Denture stomatitis is often seen in the soft tissue of the palate. To prevent denture stomatitis, the patient has to clean his or her dentures regularly and remove it at night. Clean the dentures by using soft cloth and dishwashing liquid and soak it in water at night. There are a few things that can be done to help older people who are having a difficult time maintaining their oral health on their own. Friends and family members should constantly remind them to brush and clean their teeth daily. Also, family members should make sure they go to the dentist on a regular basis. 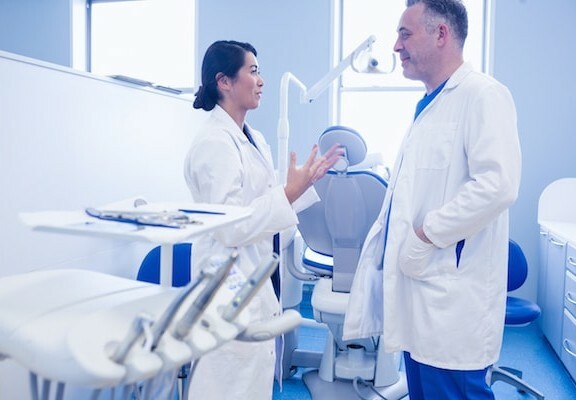 The dentist, especially one who specializes in handling elderly and disabled patients, can provide helpful tips regarding the best approach in maintaining their oral health.